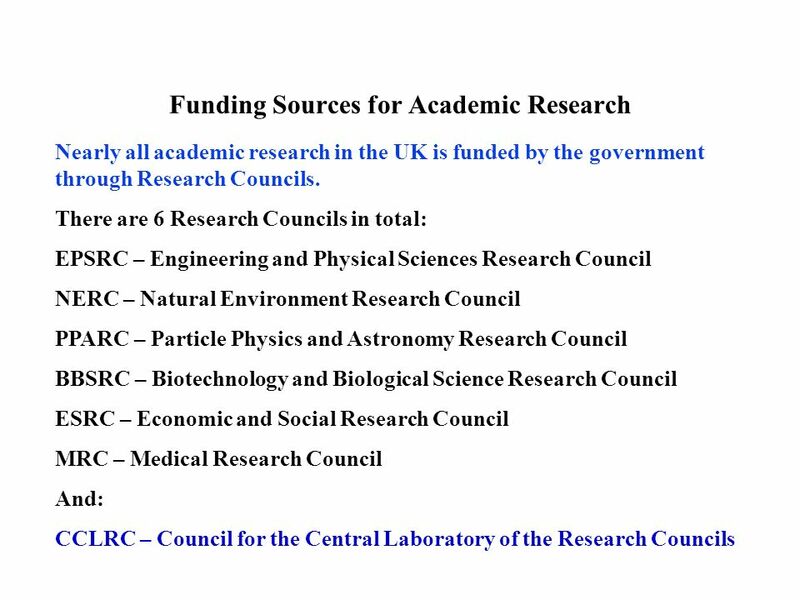 1 There are 6 Research Councils in total: EPSRC – Engineering and Physical Sciences Research Council NERC – Natural Environment Research Council PPARC – Particle Physics and Astronomy Research Council BBSRC – Biotechnology and Biological Science Research Council ESRC – Economic and Social Research Council MRC – Medical Research Council And: CCLRC – Council for the Central Laboratory of the Research Councils Funding Sources for Academic Research Nearly all academic research in the UK is funded by the government through Research Councils. 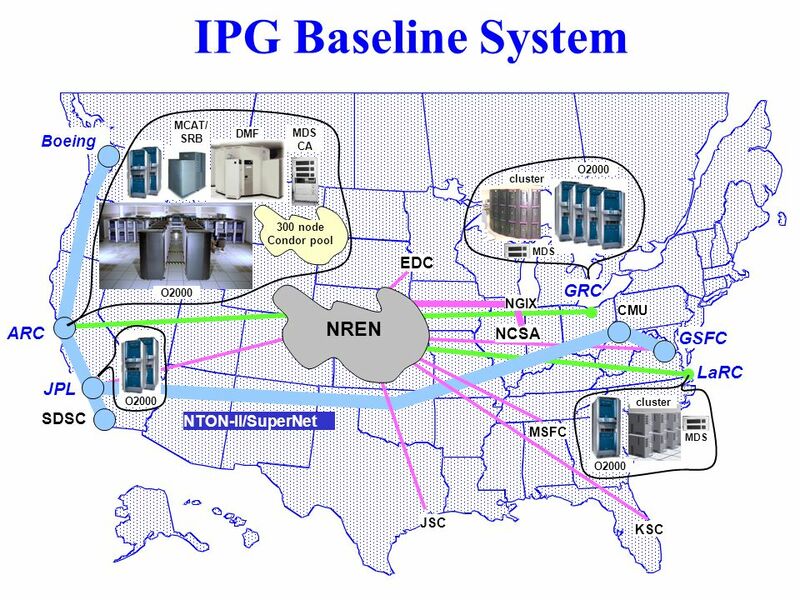 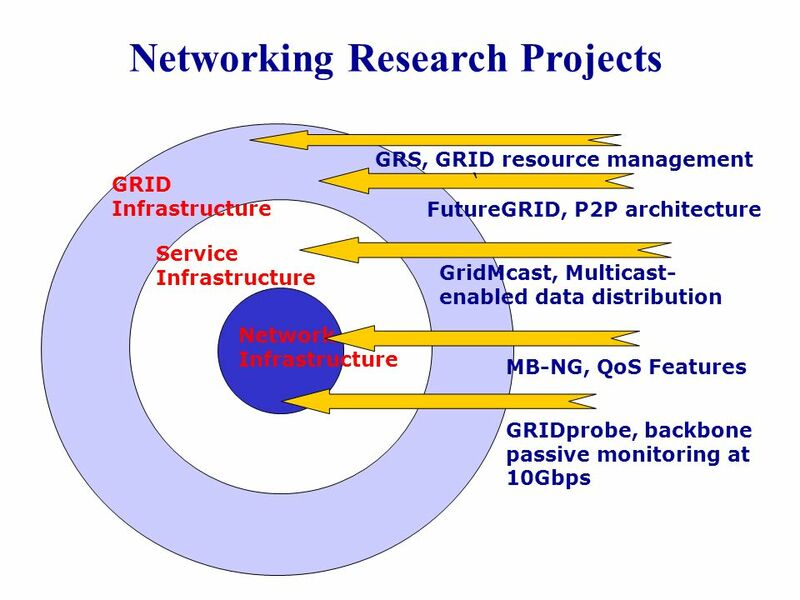 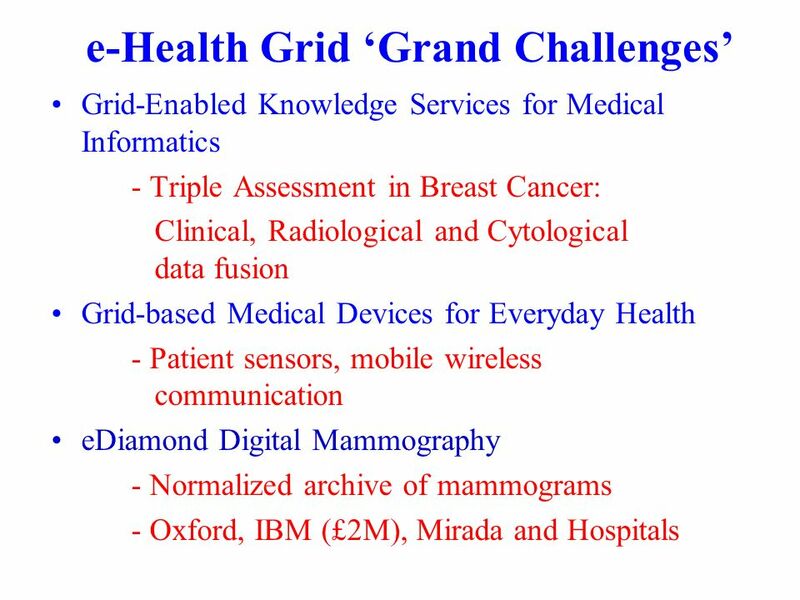 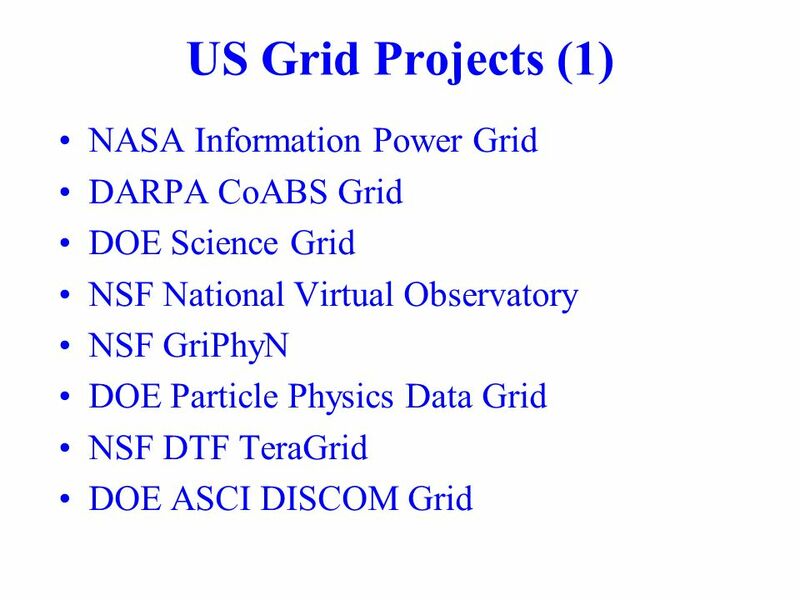 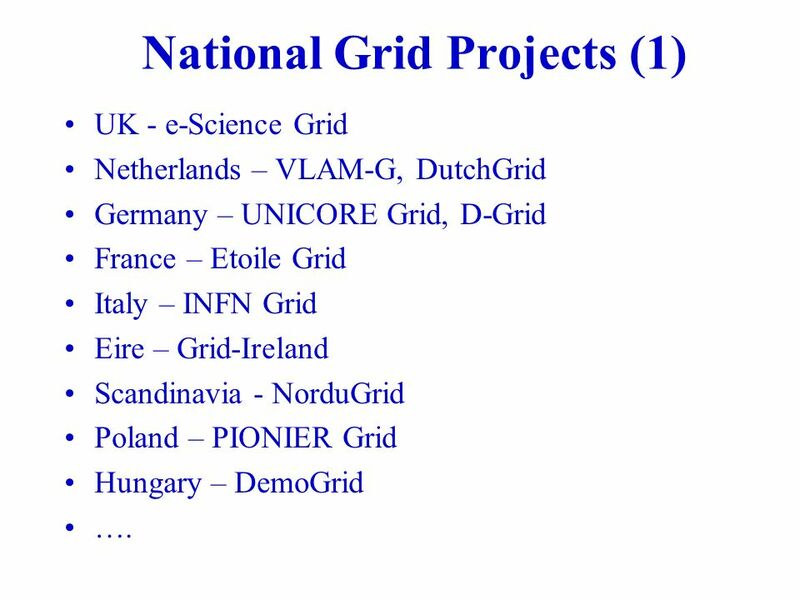 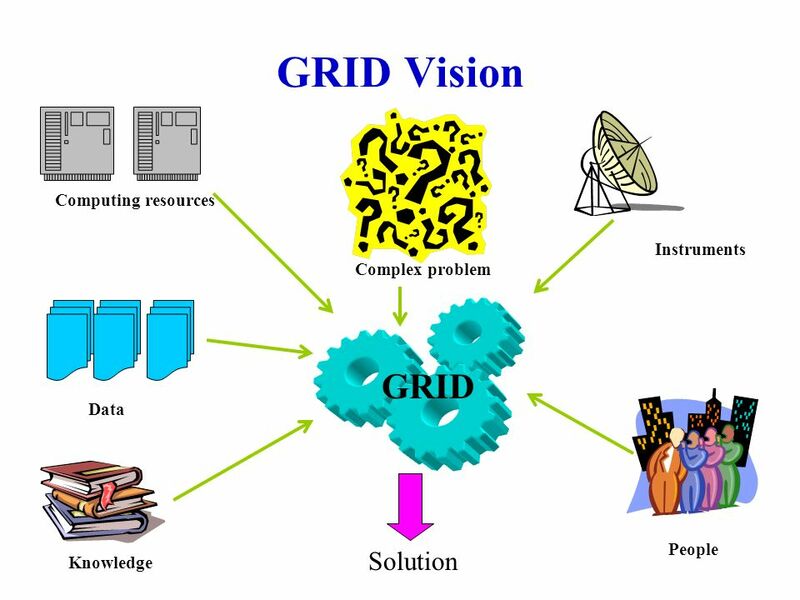 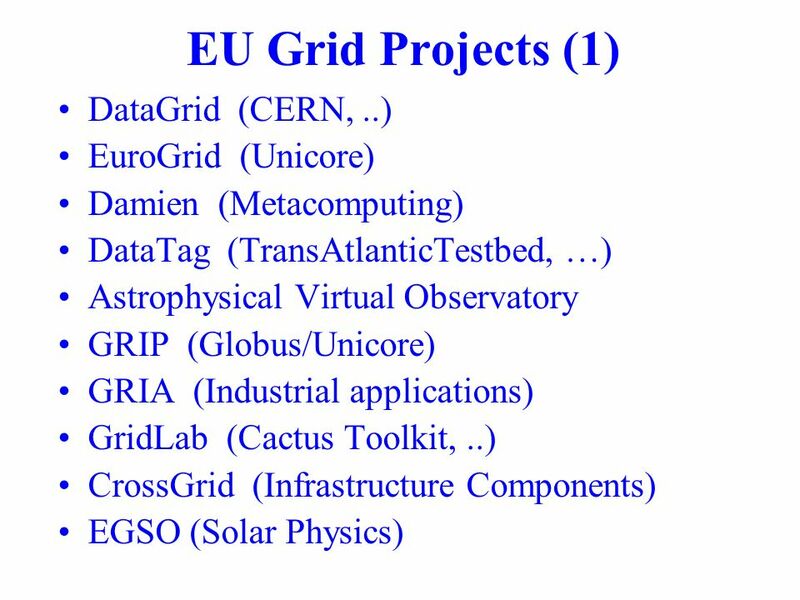 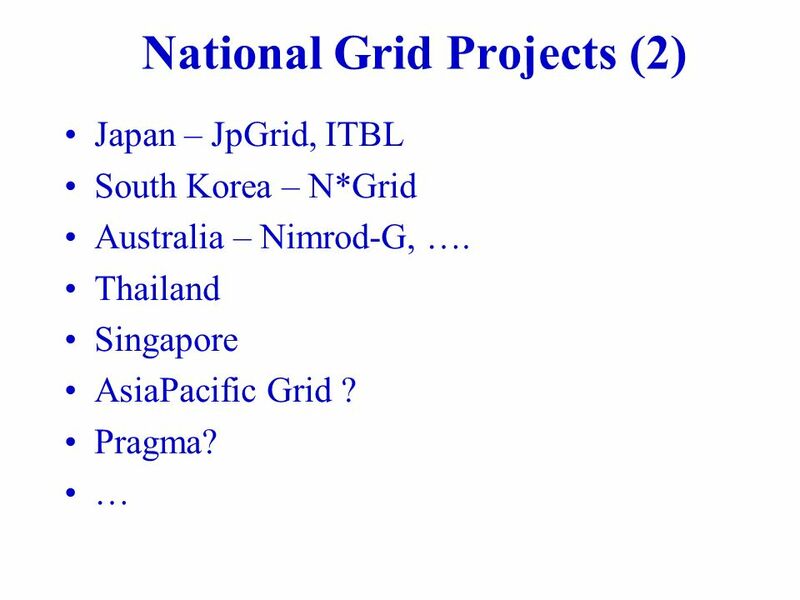 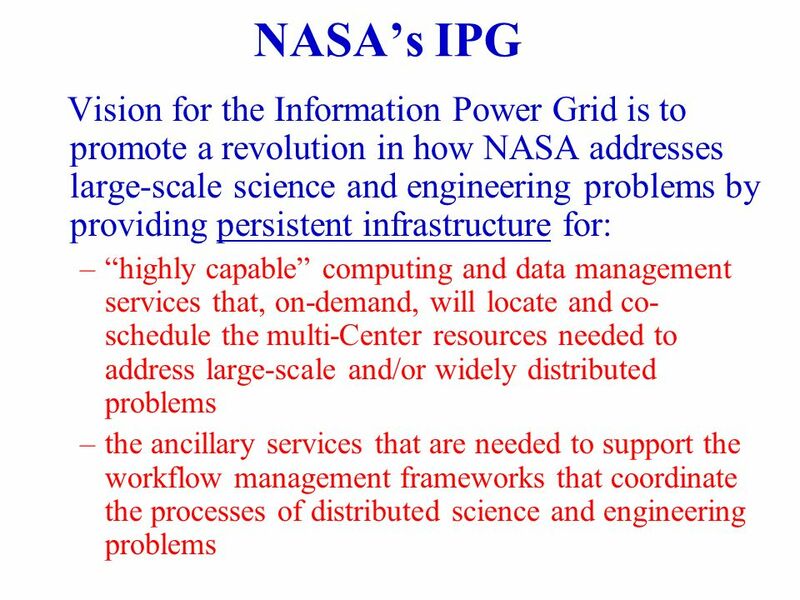 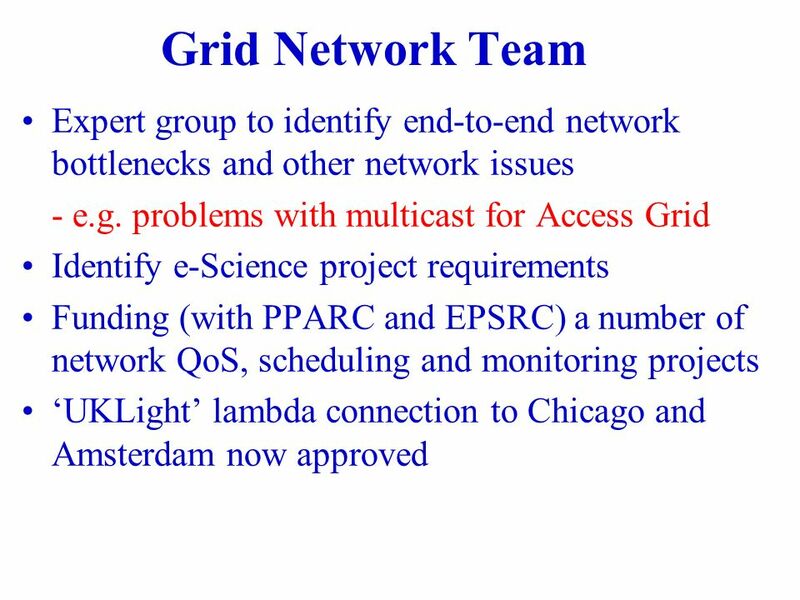 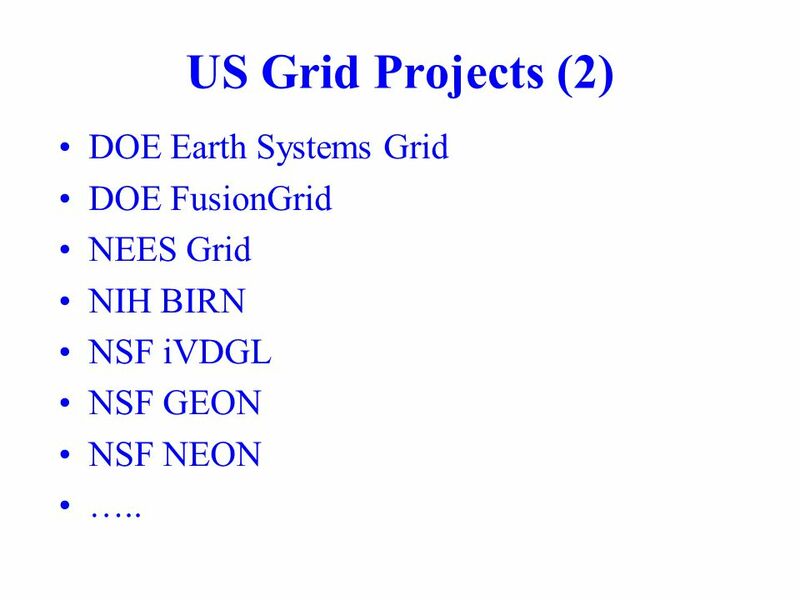 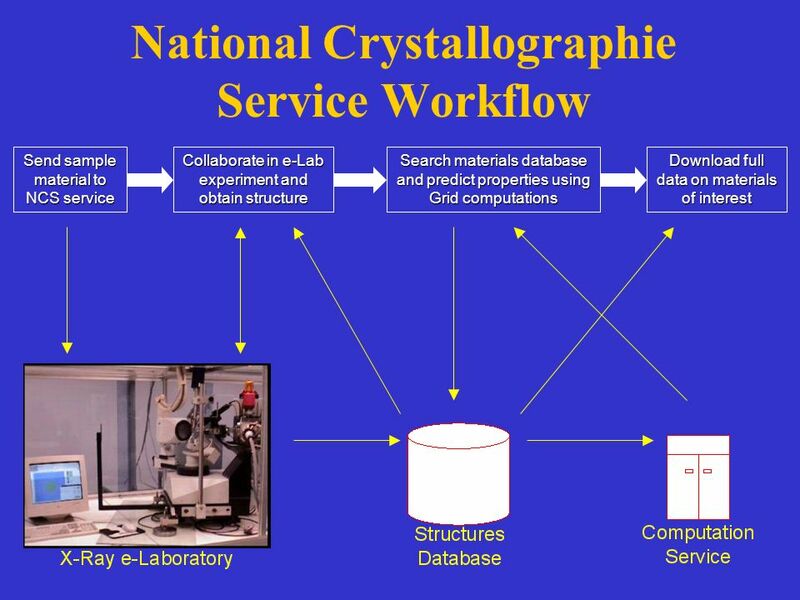 11 US Grid Projects (2) DOE Earth Systems Grid DOE FusionGrid NEES Grid NIH BIRN NSF iVDGL NSF GEON NSF NEON …..
14 National Grid Projects (1) UK - e-Science Grid Netherlands – VLAM-G, DutchGrid Germany – UNICORE Grid, D-Grid France – Etoile Grid Italy – INFN Grid Eire – Grid-Ireland Scandinavia - NorduGrid Poland – PIONIER Grid Hungary – DemoGrid …. 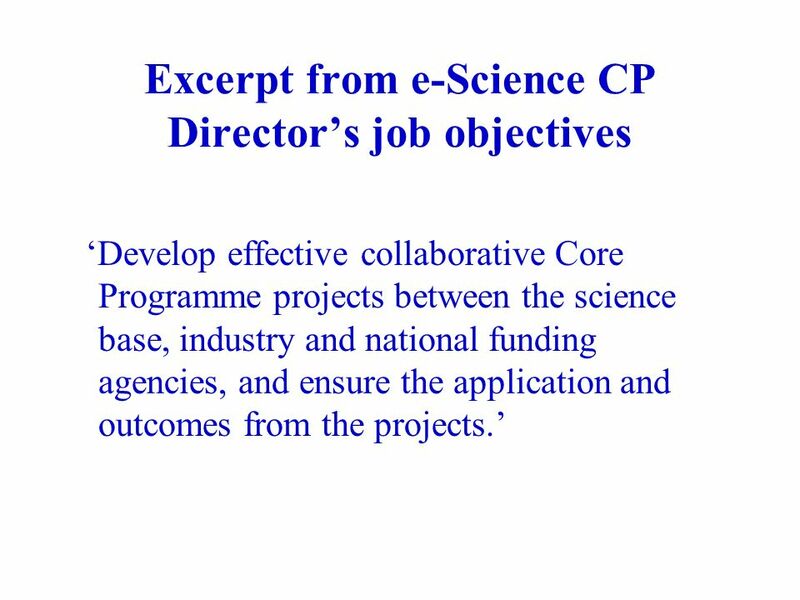 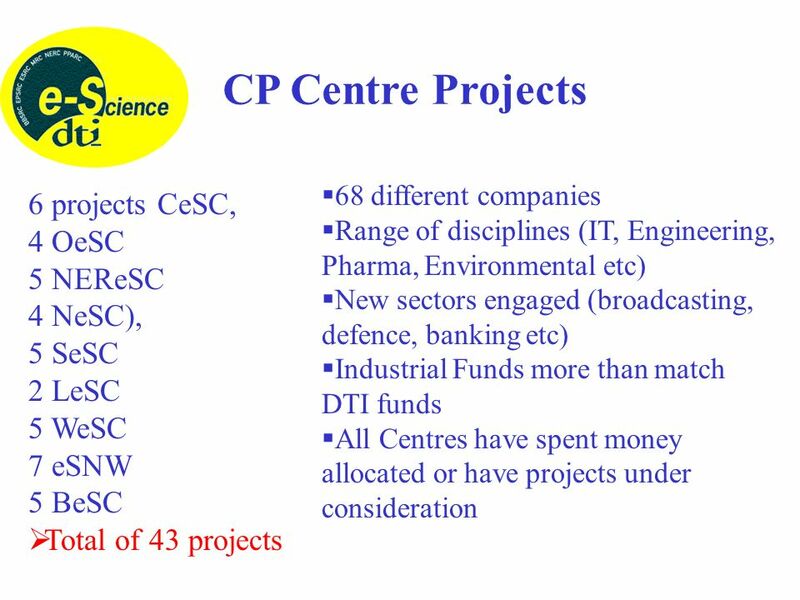 19 Excerpt from e-Science CP Directors job objectives Develop effective collaborative Core Programme projects between the science base, industry and national funding agencies, and ensure the application and outcomes from the projects. 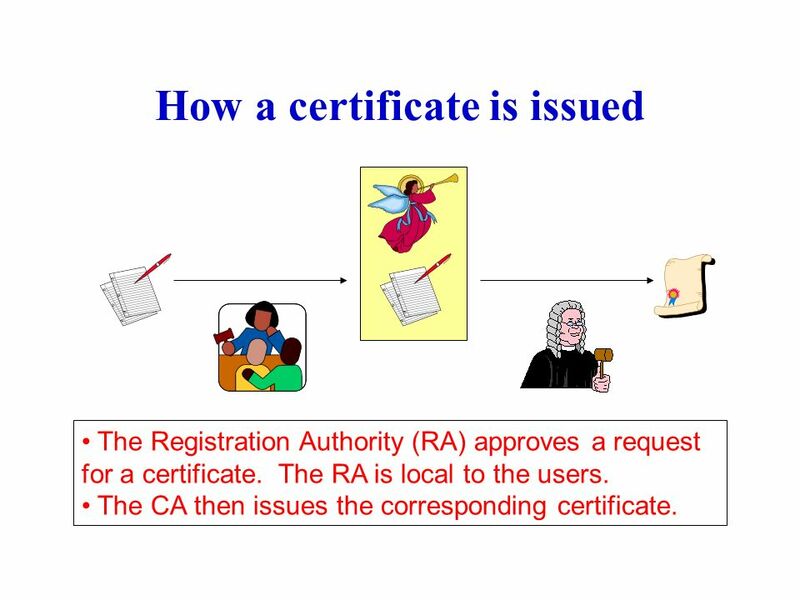 43 How a certificate is issued The Registration Authority (RA) approves a request for a certificate. 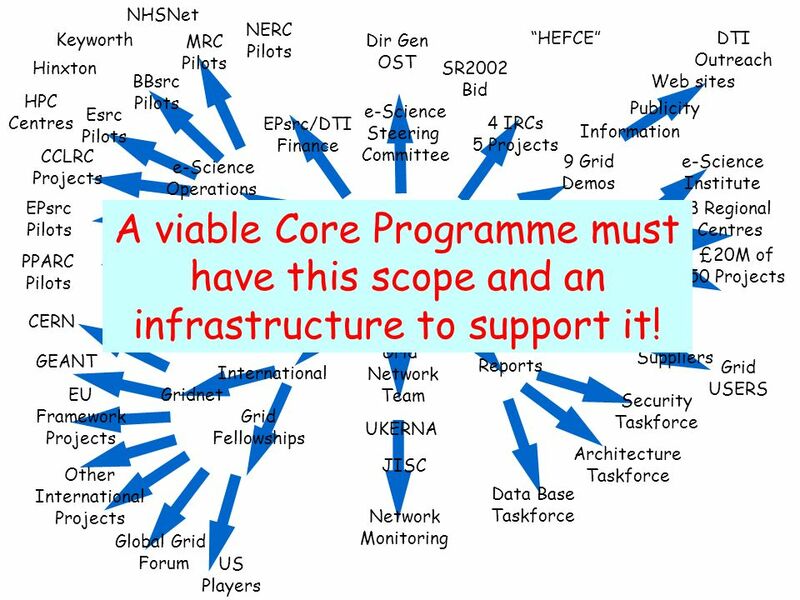 The RA is local to the users. 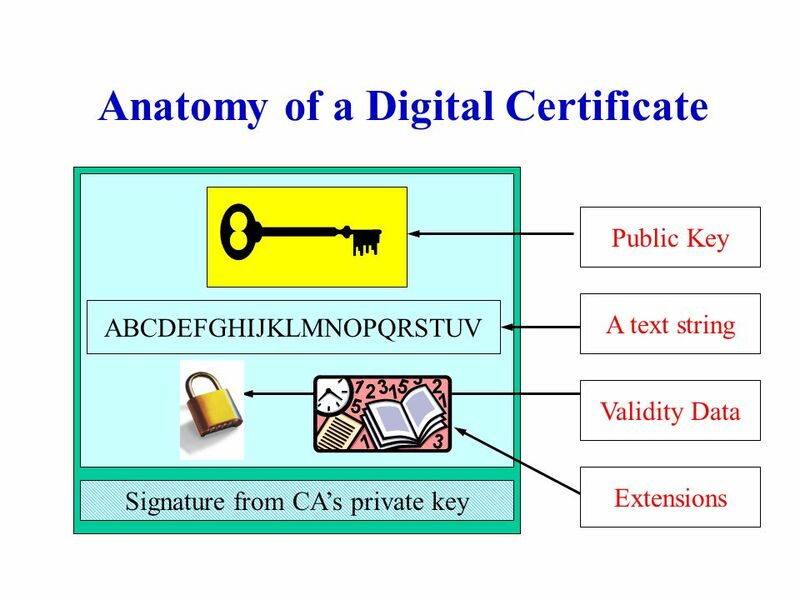 The CA then issues the corresponding certificate. 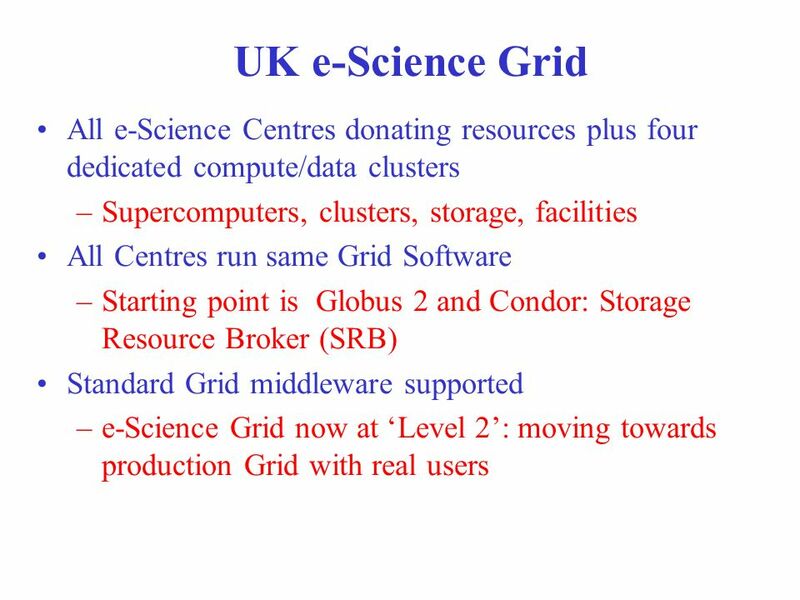 47 UK Backbone Infrastructure Based on SuperJANET4 academic network run by UKERNA for JISC WorldCom(!) 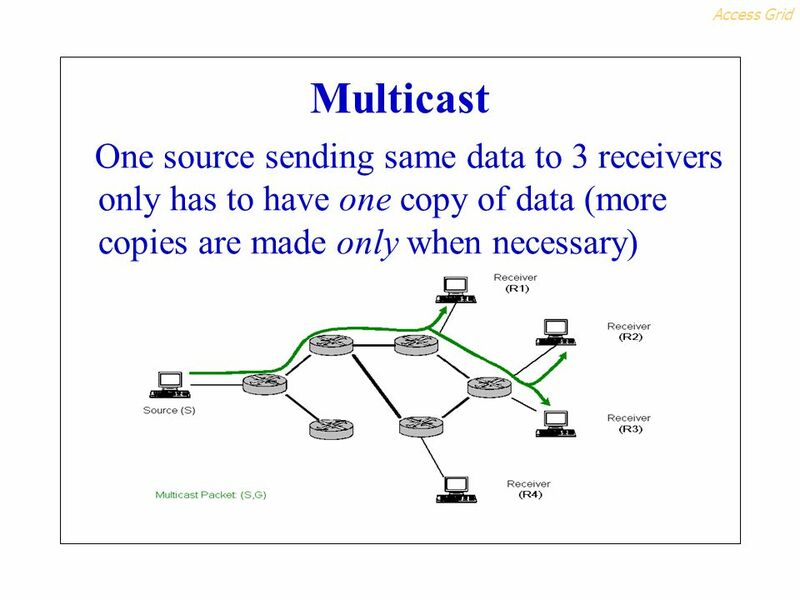 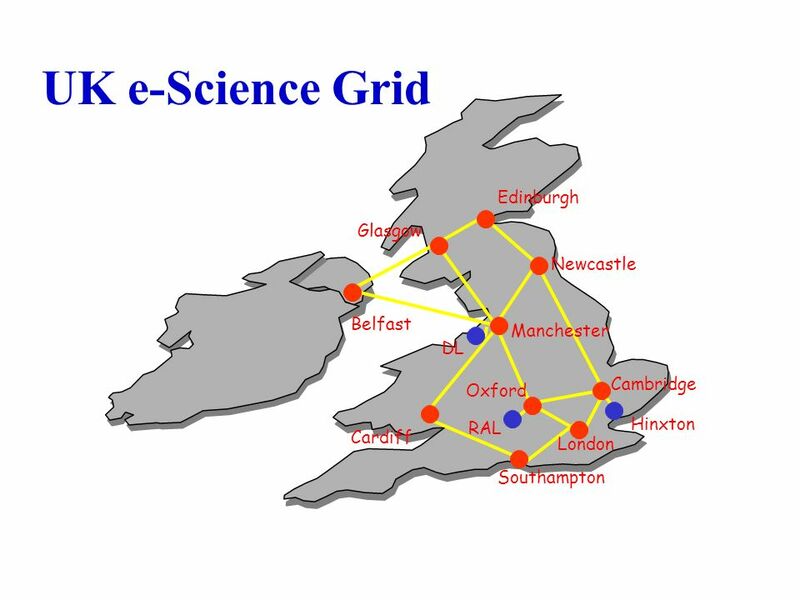 providing national backbone for SJ4 – now at 20Gbps Connections to universities via MANs at up to 2.5Gbps Last mile problem? 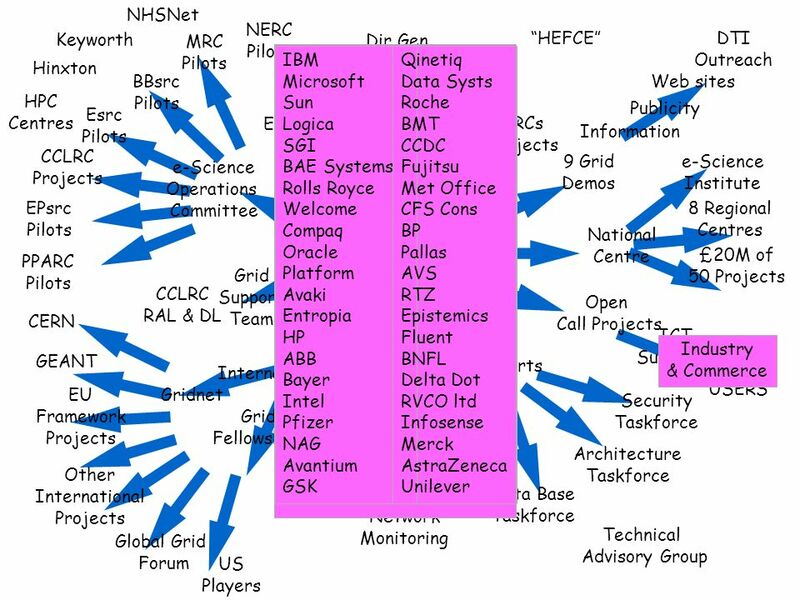 Research network use versus teaching, web- searching, email – differential services? 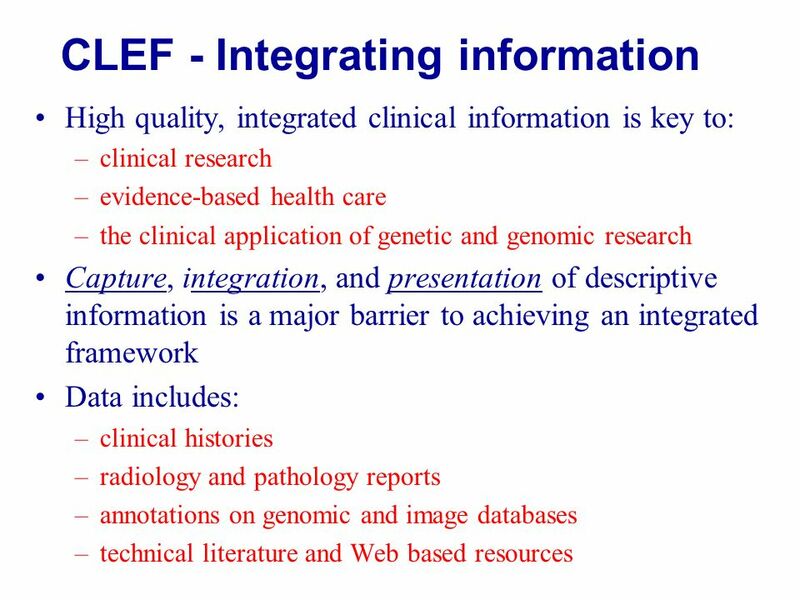 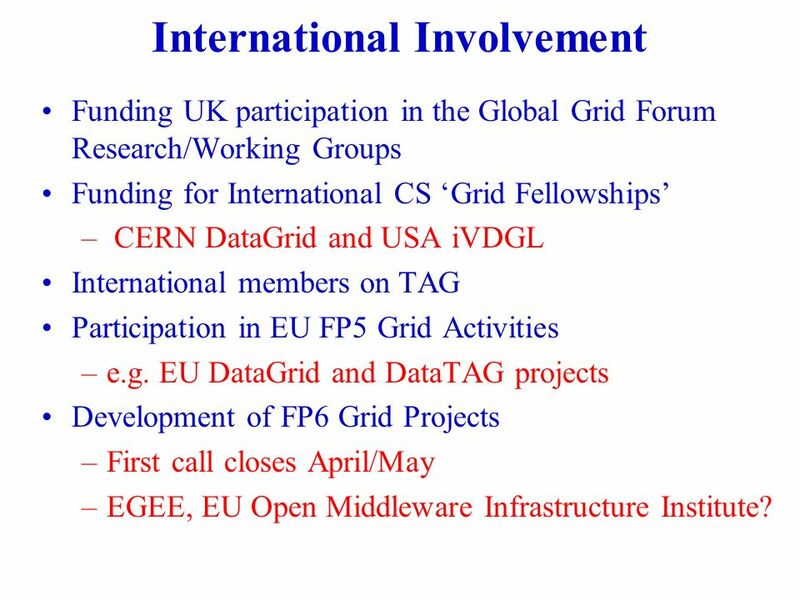 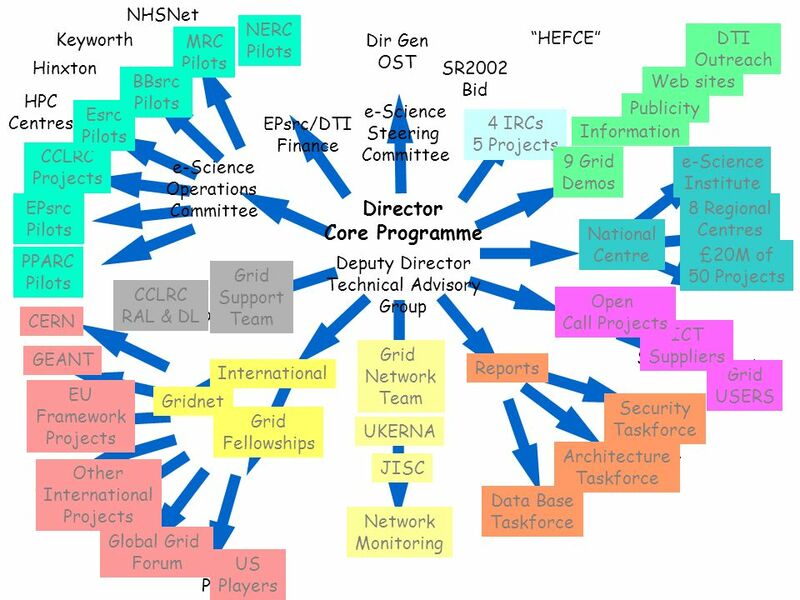 60 International Involvement Funding UK participation in the Global Grid Forum Research/Working Groups Funding for International CS Grid Fellowships – CERN DataGrid and USA iVDGL International members on TAG Participation in EU FP5 Grid Activities –e.g. 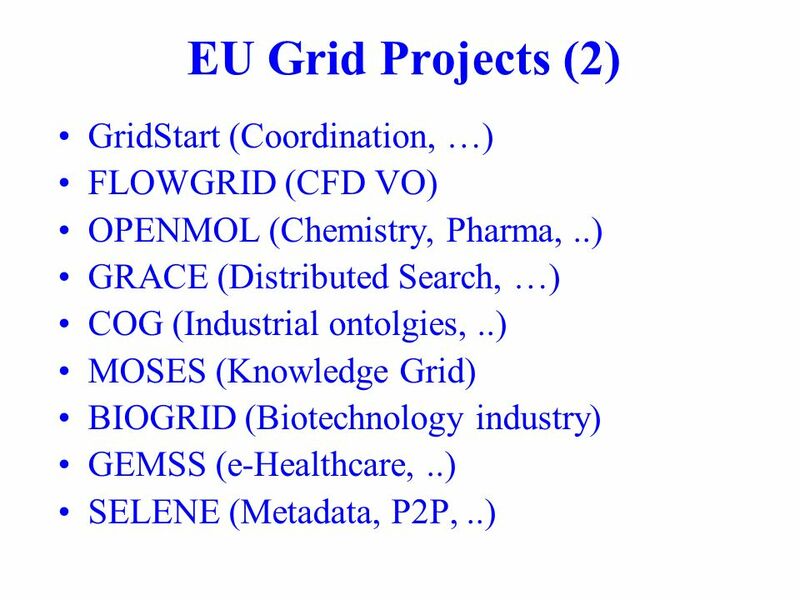 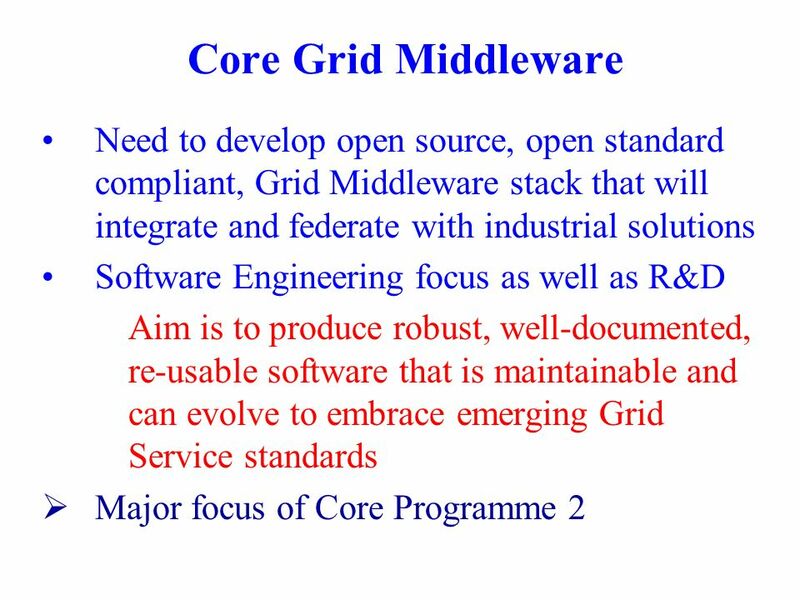 EU DataGrid and DataTAG projects Development of FP6 Grid Projects –First call closes April/May –EGEE, EU Open Middleware Infrastructure Institute? 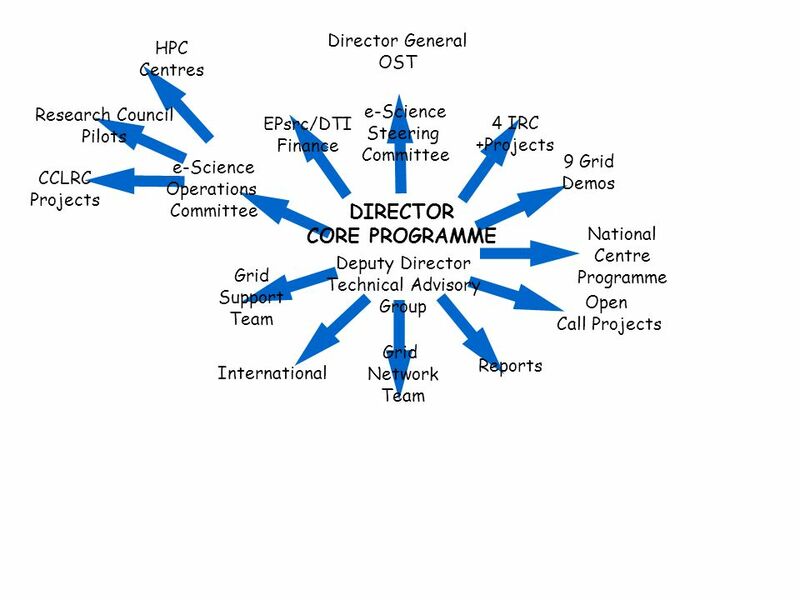 72 Information International Director Core Programme National Centre e-Science Institute Data Base Taskforce Architecture Taskforce 8 Regional Centres Security Taskforce UKERNA EPsrc/DTI Finance Grid Network Team Global Grid Forum e-Science Steering Committee CCLRC Projects NERC Pilots Grid Support Team Dir Gen OST e-Science Operations Committee Esrc Pilots MRC Pilots BBsrc Pilots PPARC Pilots EPsrc Pilots HPC Centres CERN Other International Projects EU Framework Projects US Players 4 IRCs 5 Projects Grid USERS ICT Suppliers JISC Open Call Projects SR2002 Bid 9 Grid Demos DTI Outreach Reports Hinxton Network Monitoring Gridnet NHSNet Grid Fellowships Publicity Keyworth GEANT £20M of 50 Projects CCLRC RAL & DL Web sites Deputy Director Technical Advisory Group HEFCE A viable Core Programme must have this scope and an infrastructure to support it! 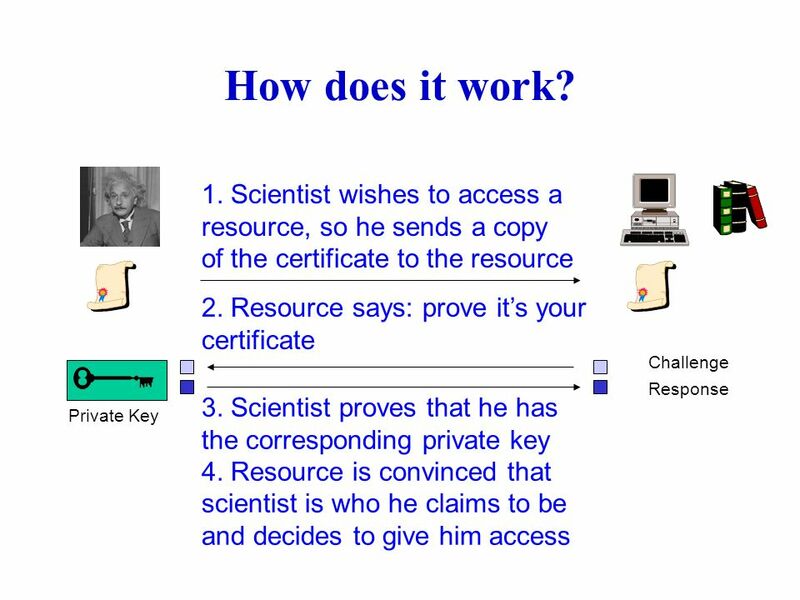 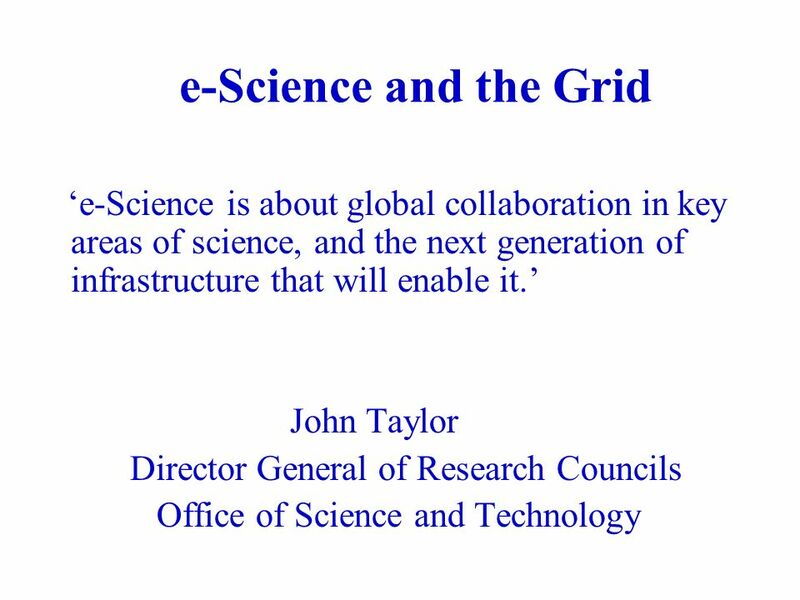 73 e-Science and the Grid e-Science will change the dynamic of the way science is undertaken. 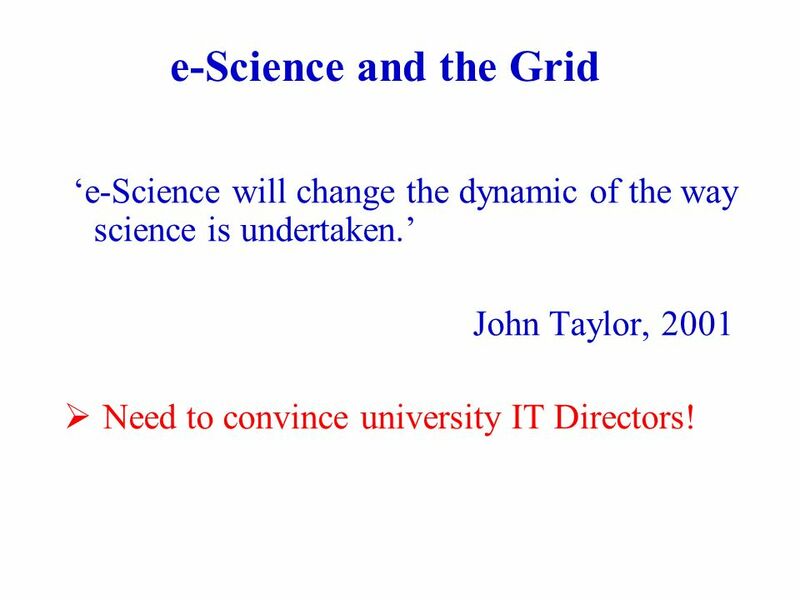 John Taylor, 2001 Need to convince university IT Directors! 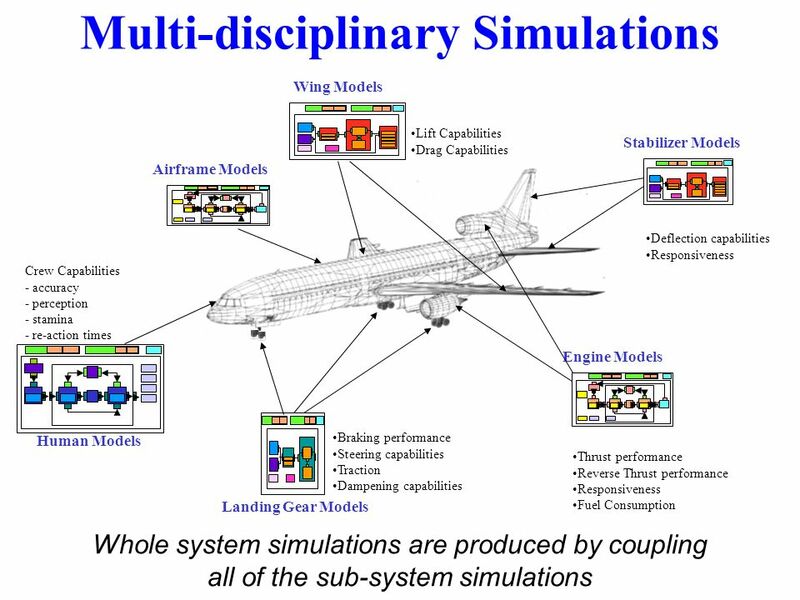 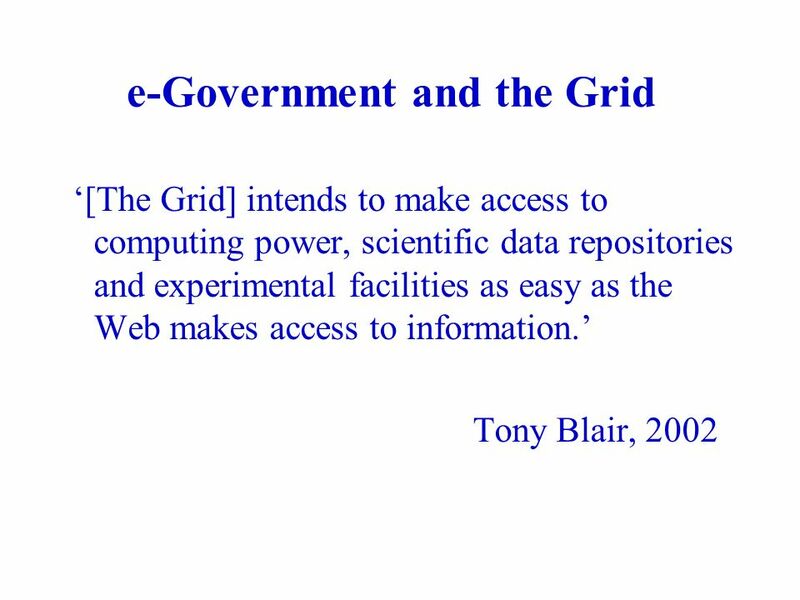 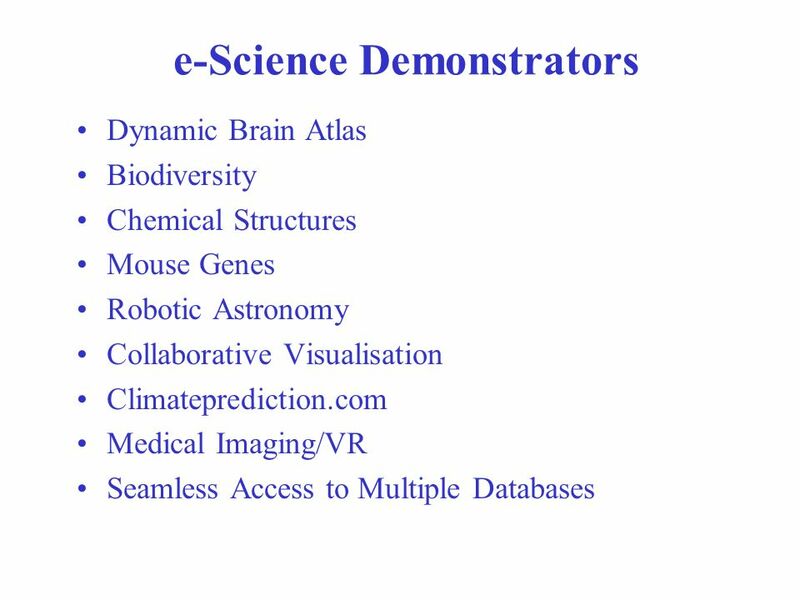 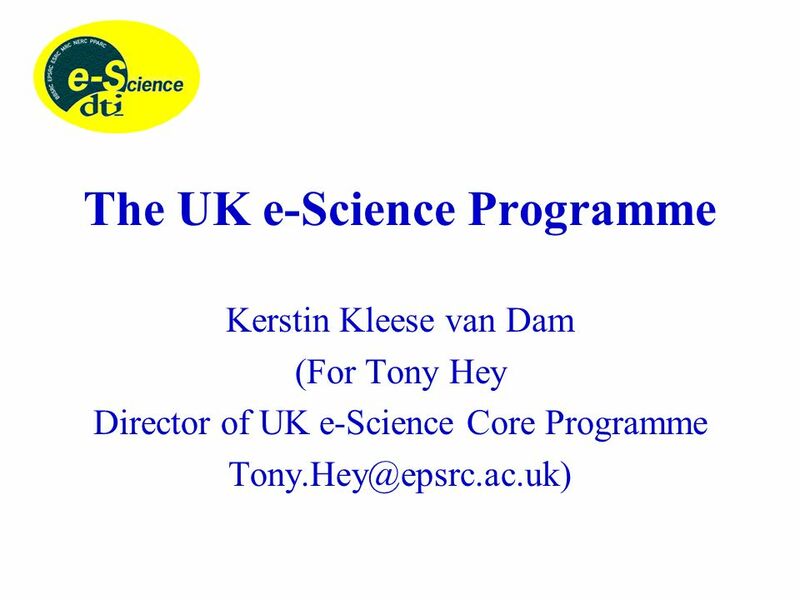 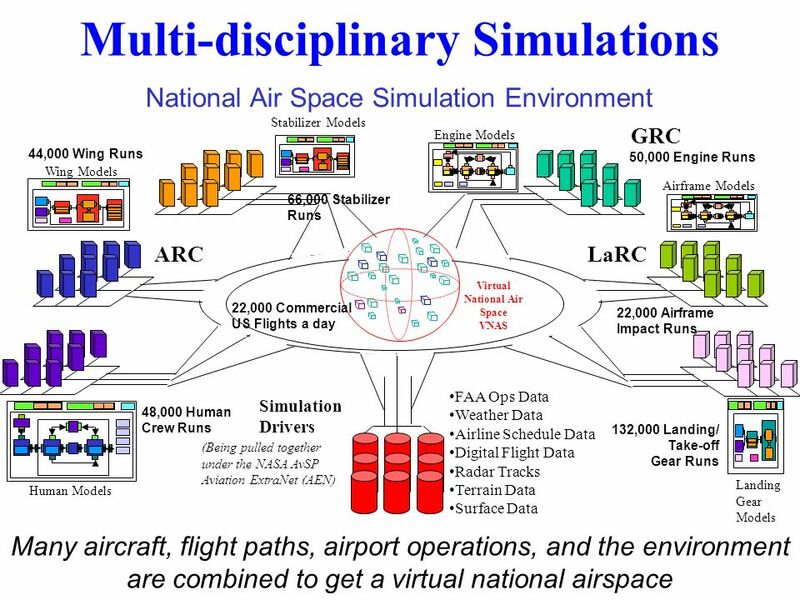 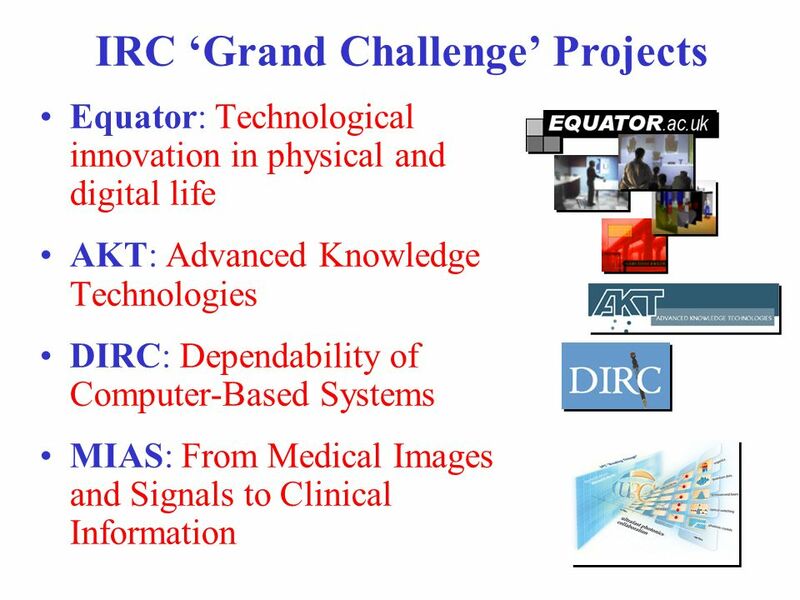 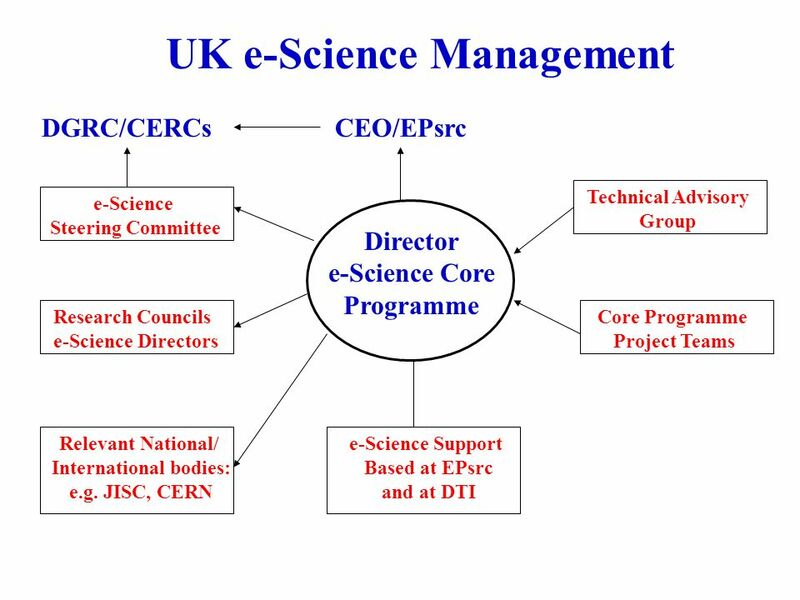 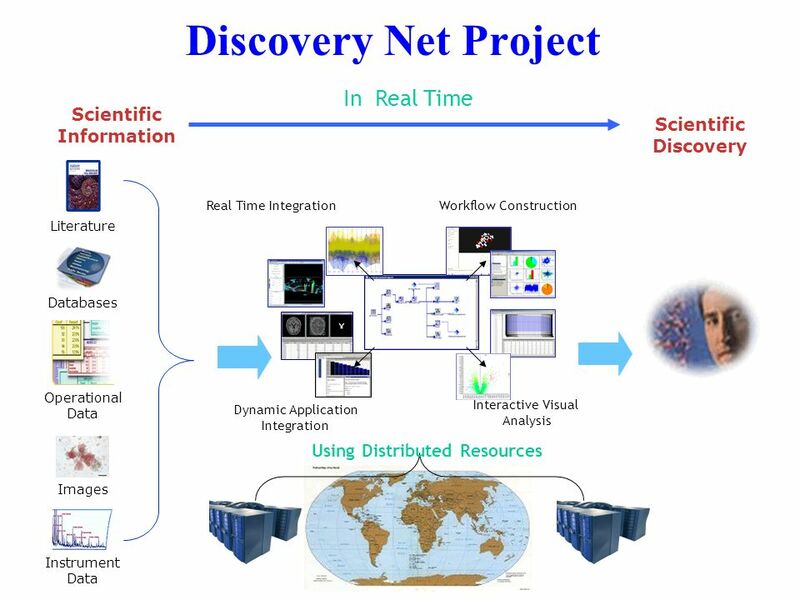 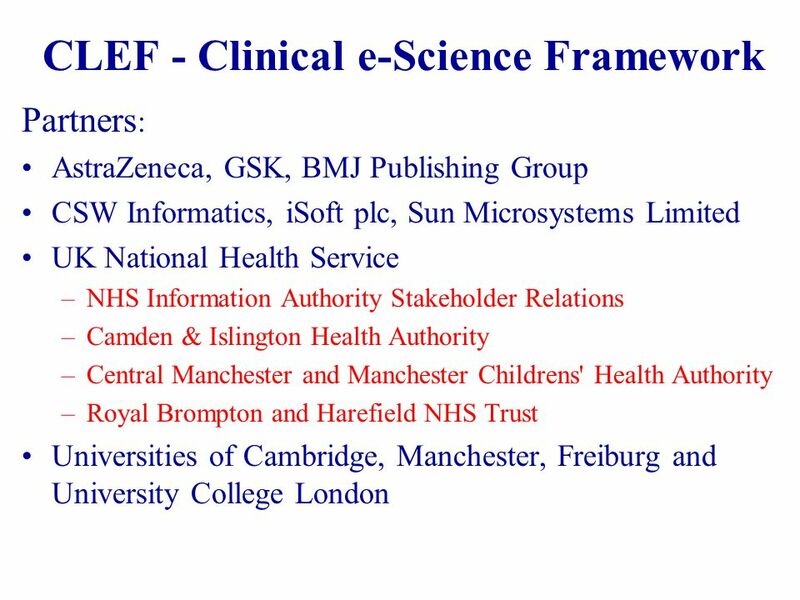 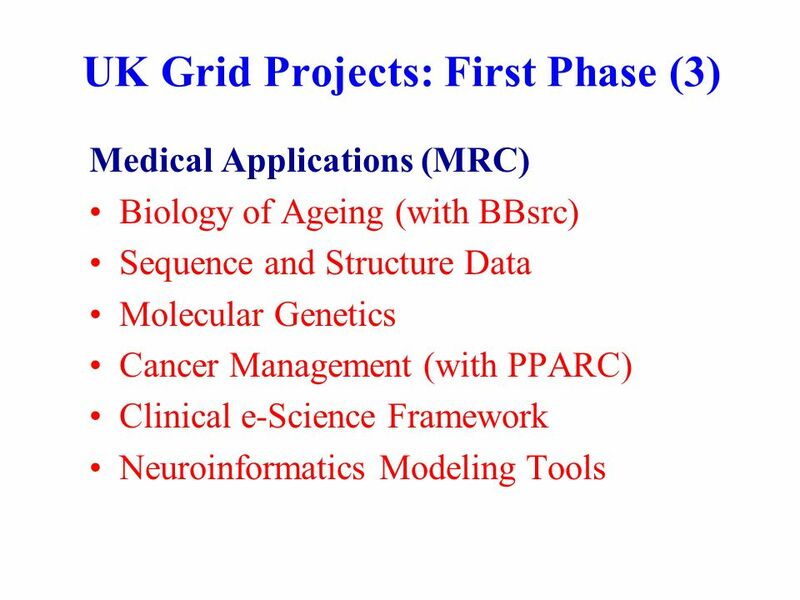 Download ppt "There are 6 Research Councils in total: EPSRC – Engineering and Physical Sciences Research Council NERC – Natural Environment Research Council PPARC –"
Tony Hey Director of UK e-Science Core Program The UK e-Science Program and the Grid. 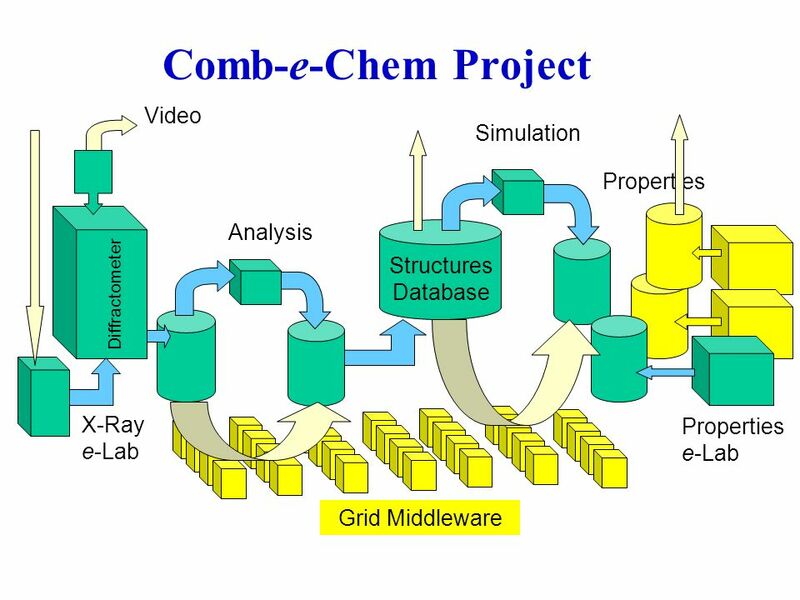 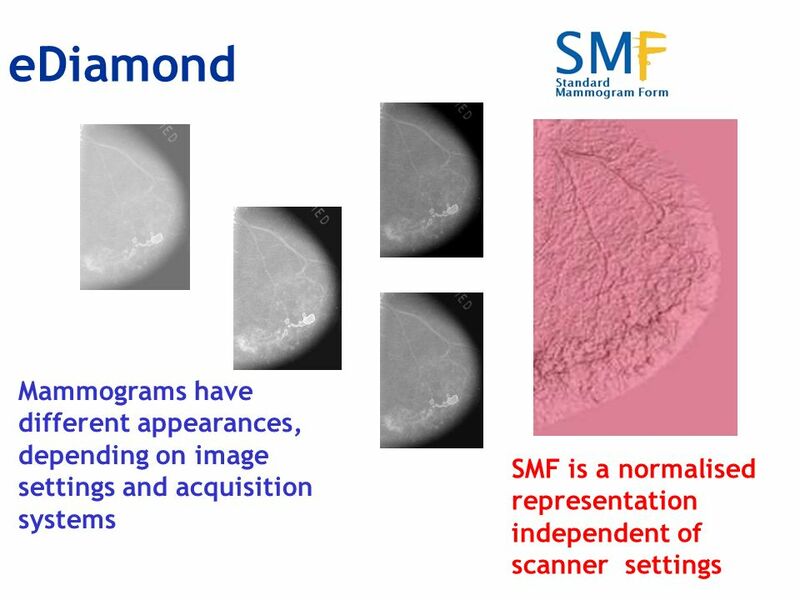 Comb-e-Chem Jeremy Frey Sept 2003 From e-Science to Jeremy Frey School of Chemistry University of Southampton, UK X-ray single Mol STM. 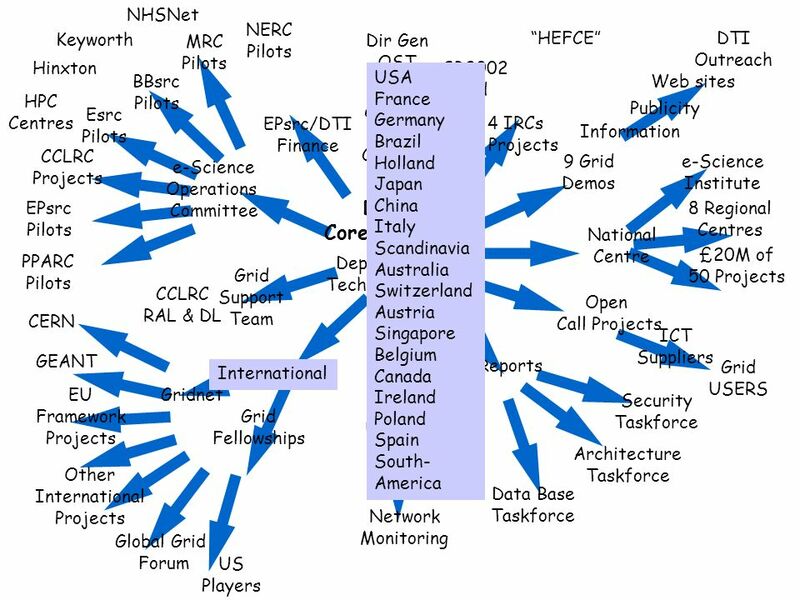 Delivery of Industrial Strength Middleware Federated Strengths Agility & Coordination Prof. Malcolm Atkinson Director 21 st January 2004. 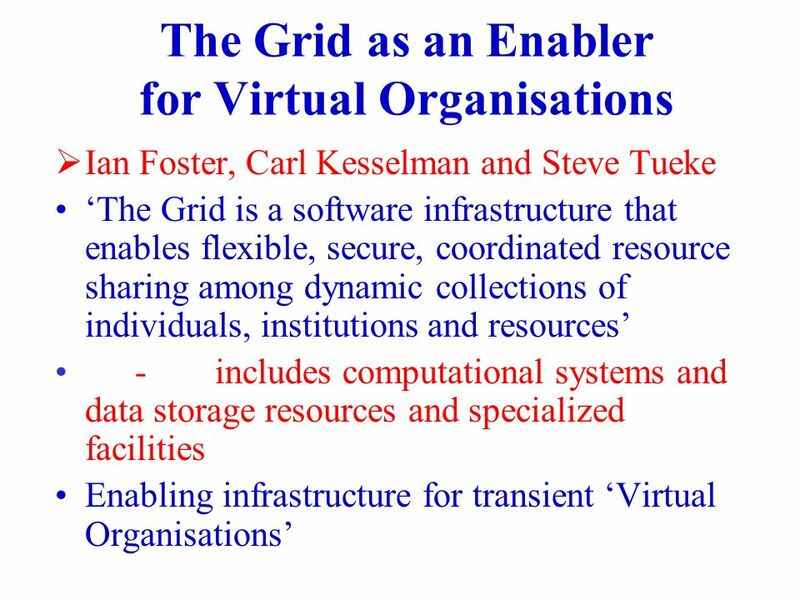 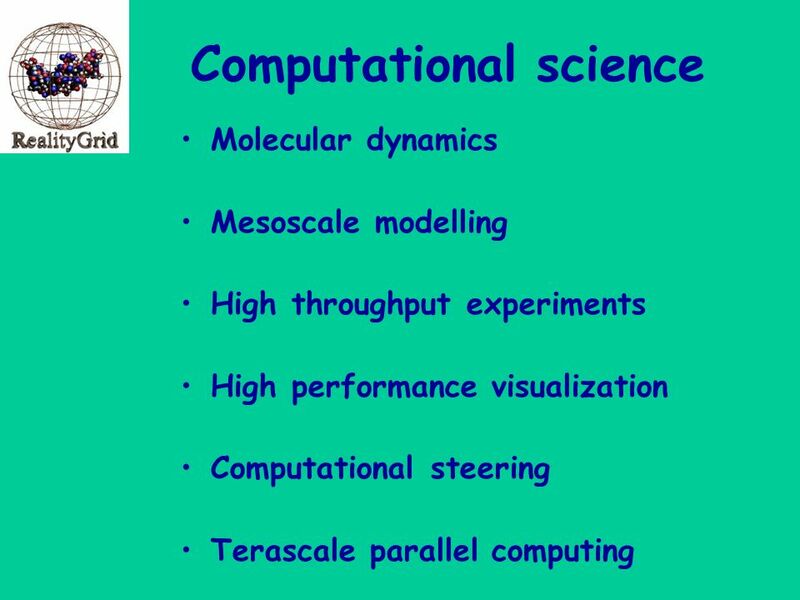 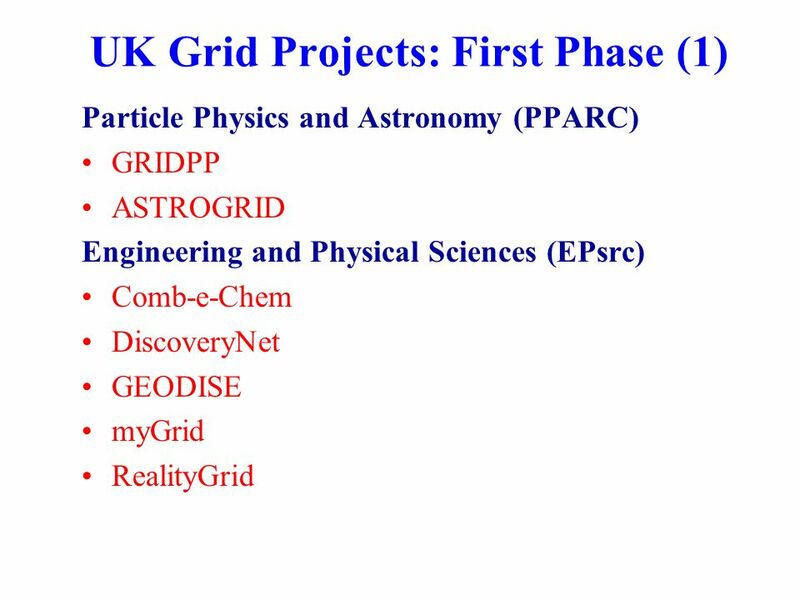 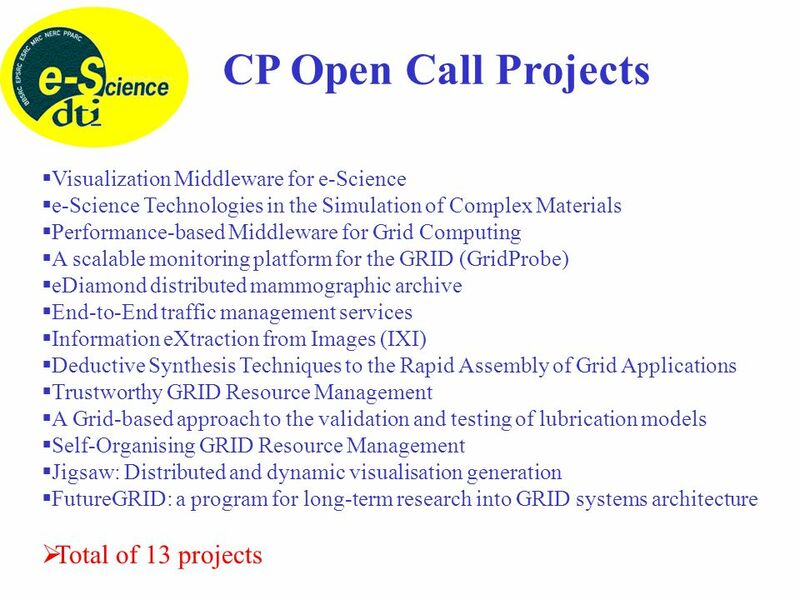 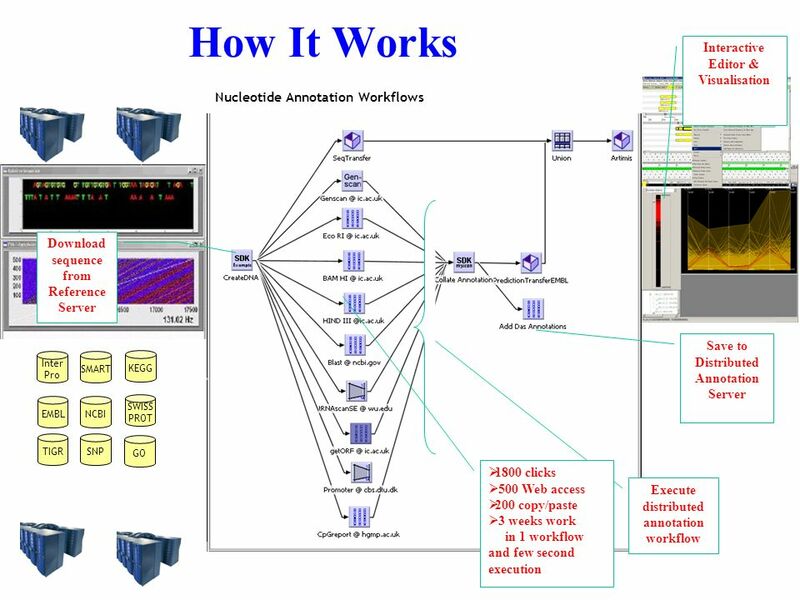 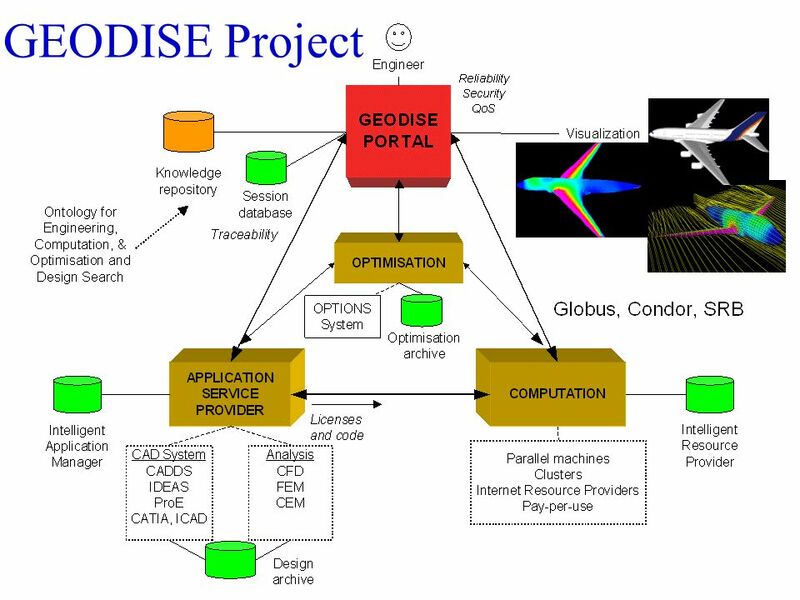 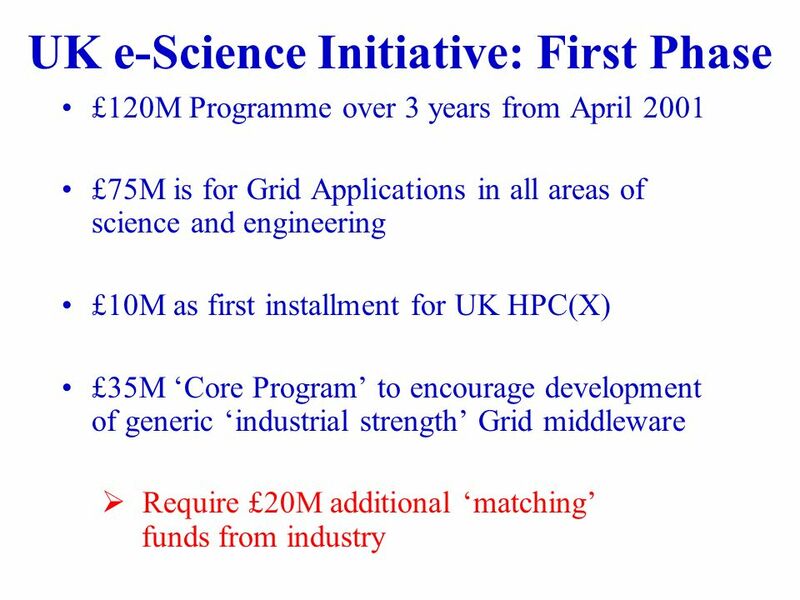 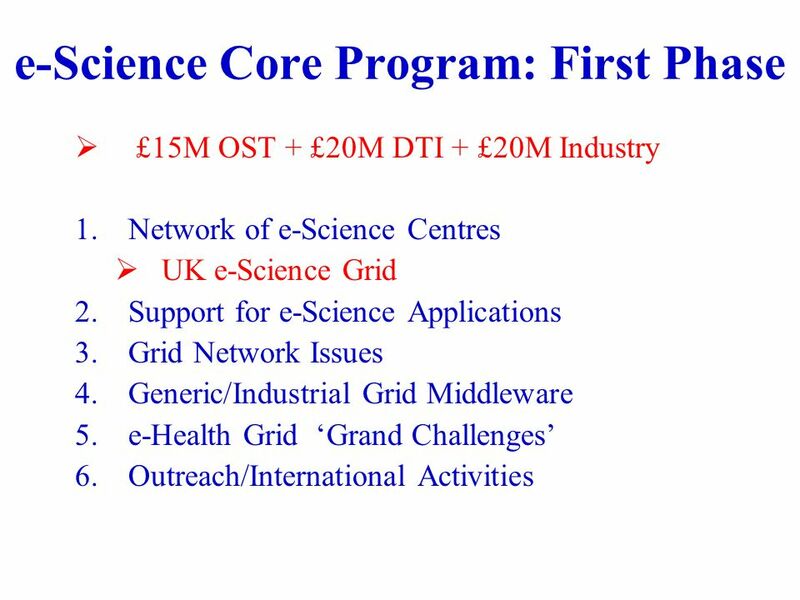 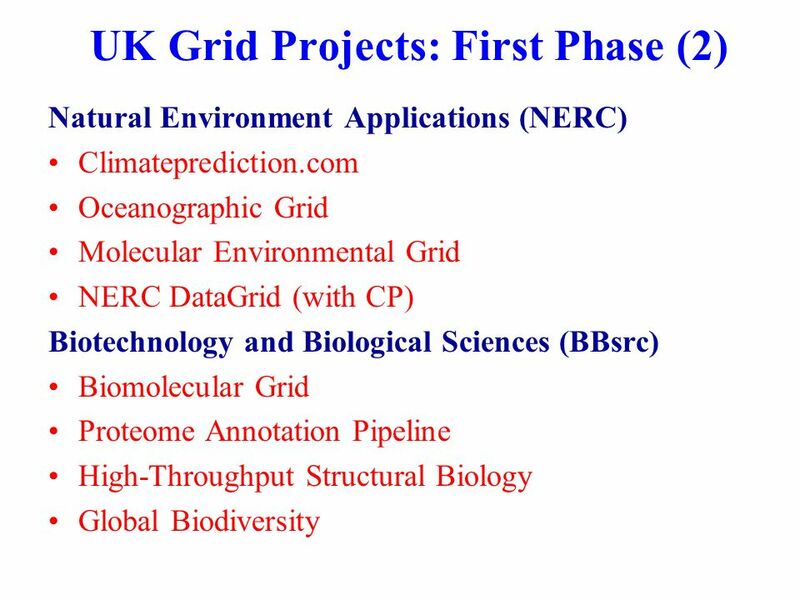 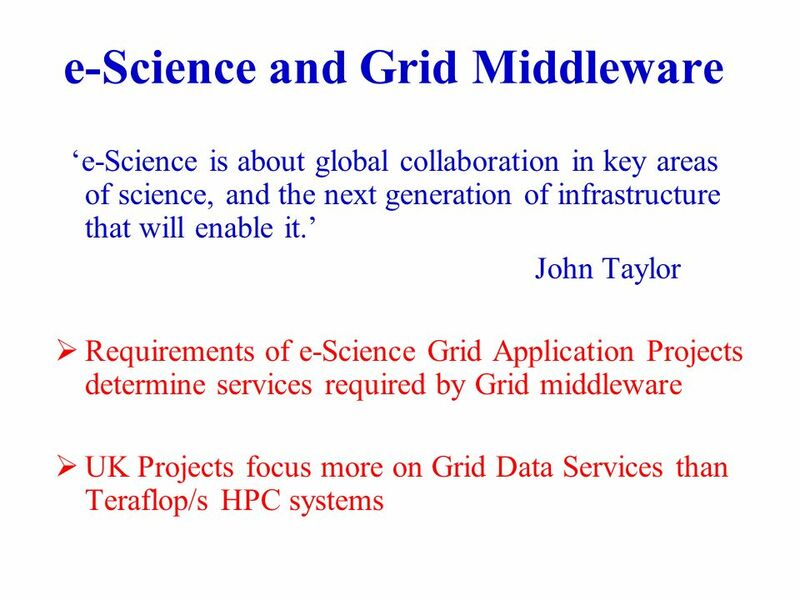 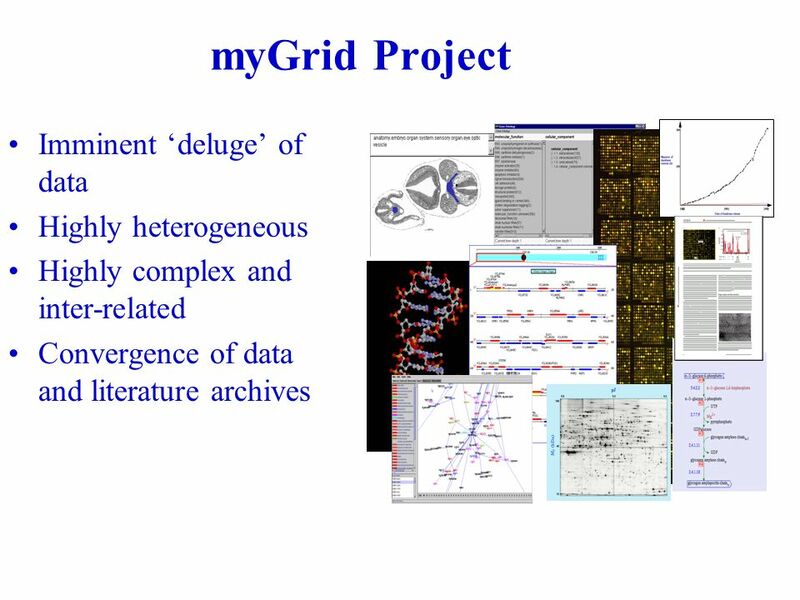 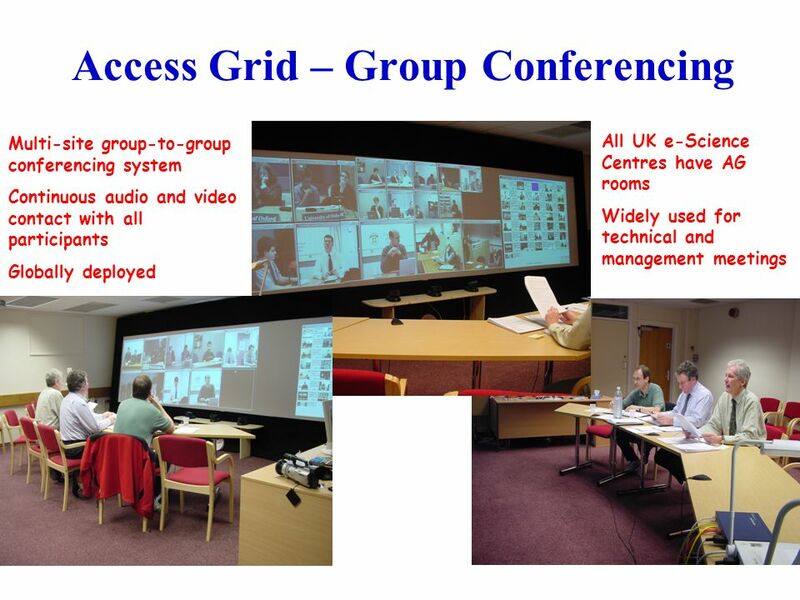 S.L.LloydATSE e-Science Visit April 2004Slide 1 GridPP – A UK Computing Grid for Particle Physics GridPP 19 UK Universities, CCLRC (RAL & Daresbury) and. 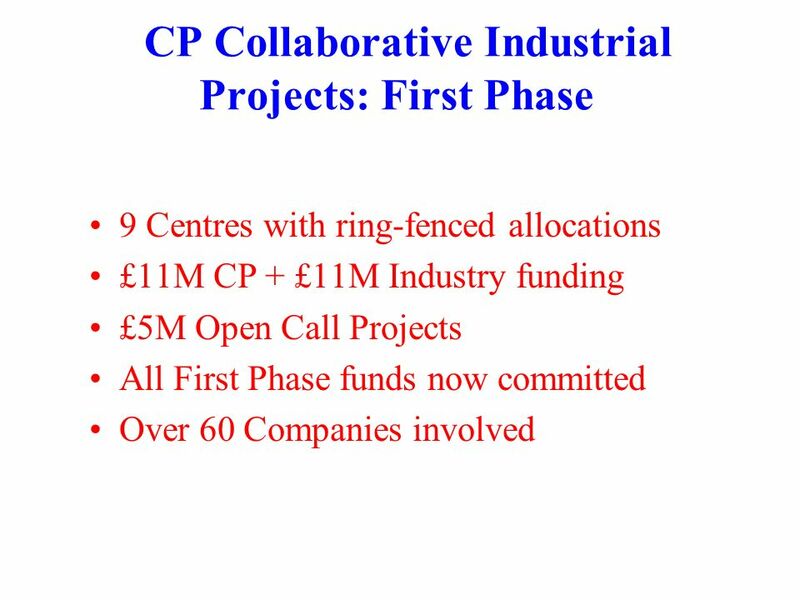 Chinese Delegation visit Malcolm Atkinson Director 18 th November 2004. 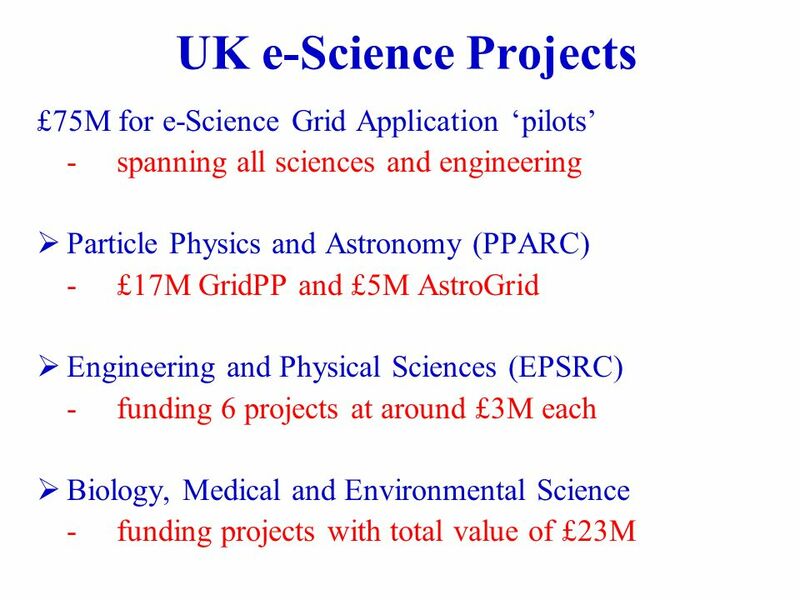 The UK e-Science Programme A View from the National e-Science Centre Malcolm Atkinson Director of NeSC Universities of Edinburgh and Glasgow CANARIE 7. 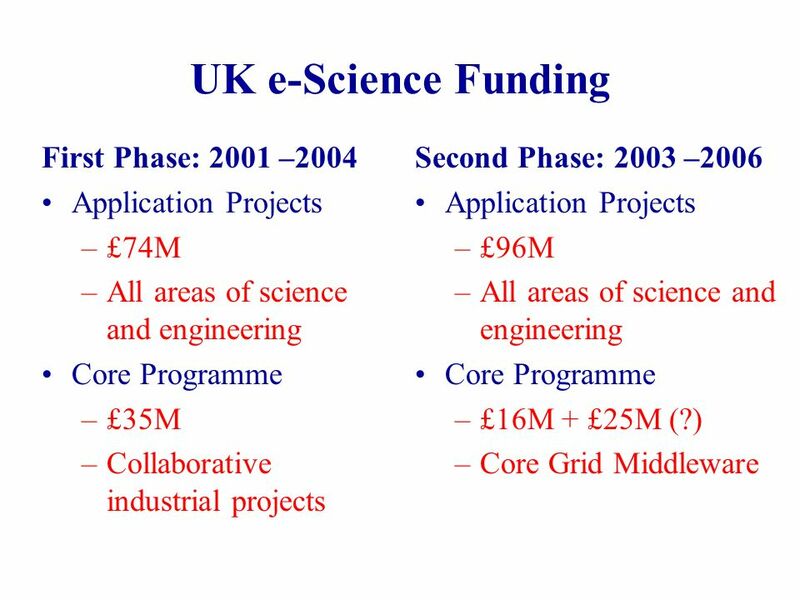 National e-Science Centre & e-Science Institute Malcolm Atkinson Director 2 nd March 2005. 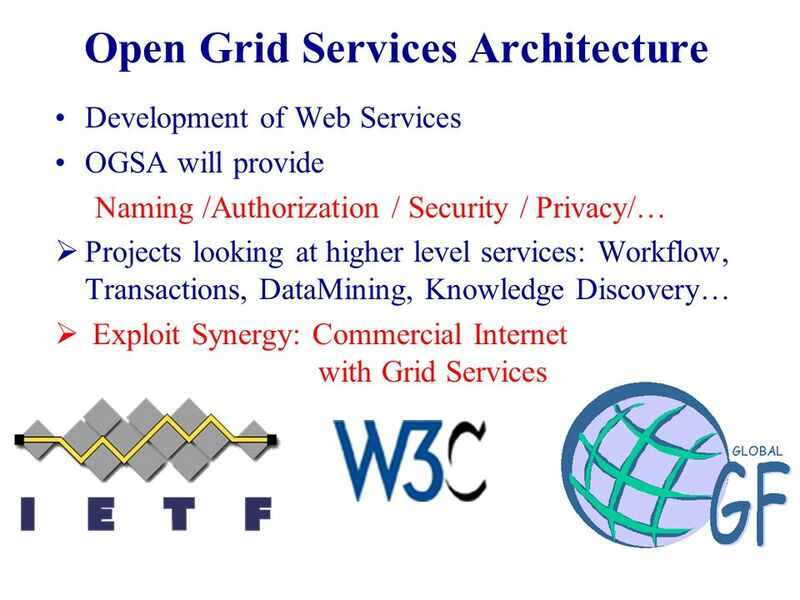 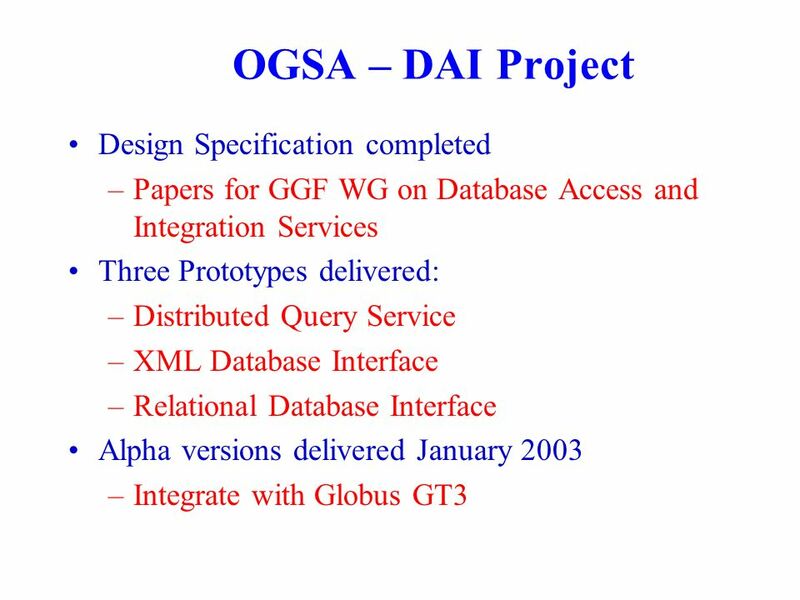 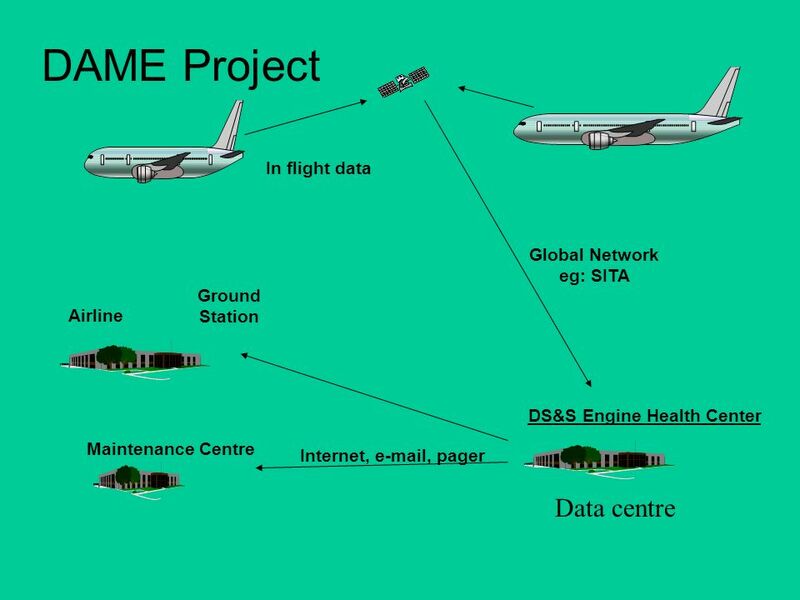 Open Grid Service Architecture - Data Access & Integration (OGSA-DAI) Dr Martin Westhead Principal Consultant, EPCC Telephone: Fax:+44. 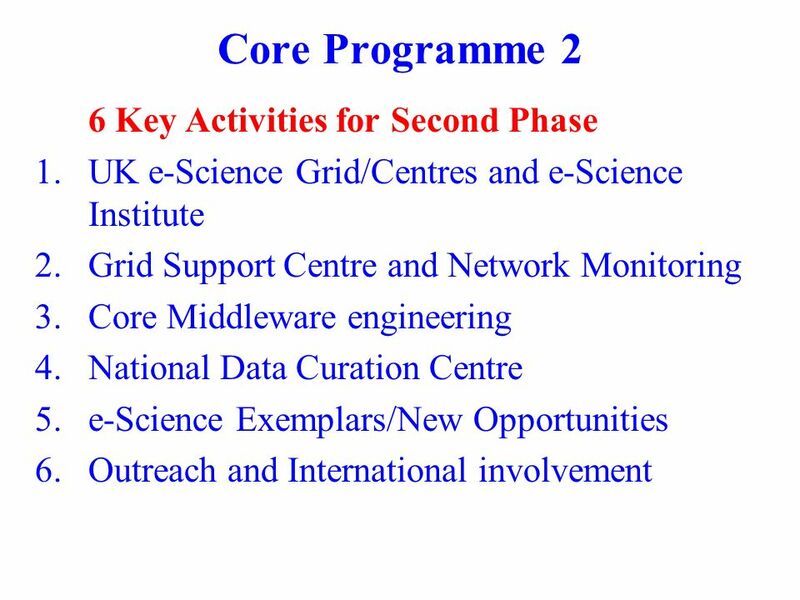 18 April 2002 e-Science Architectural Roadmap Open Meeting 1 Support for the UK e-Science Roadmap David Boyd UK Grid Support Centre CLRC e-Science Centre. 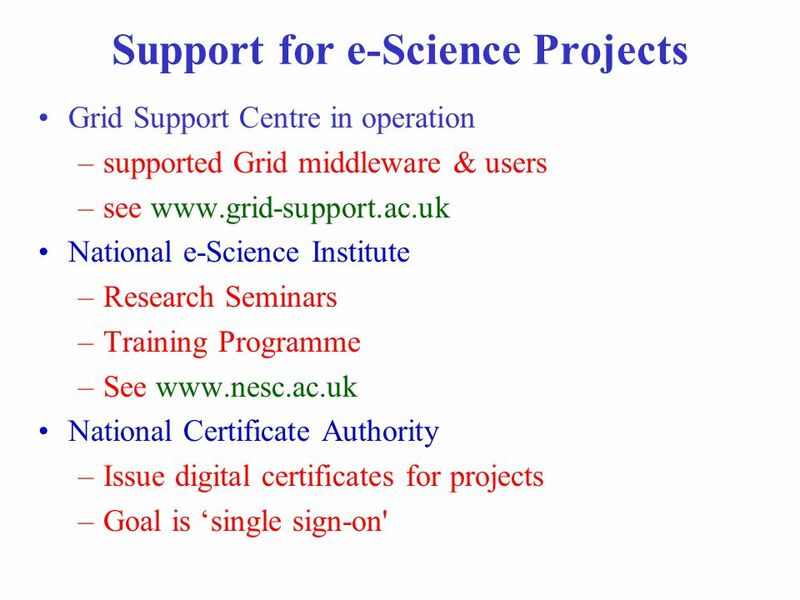 SWITCH Visit to NeSC Malcolm Atkinson Director 5 th October 2004. 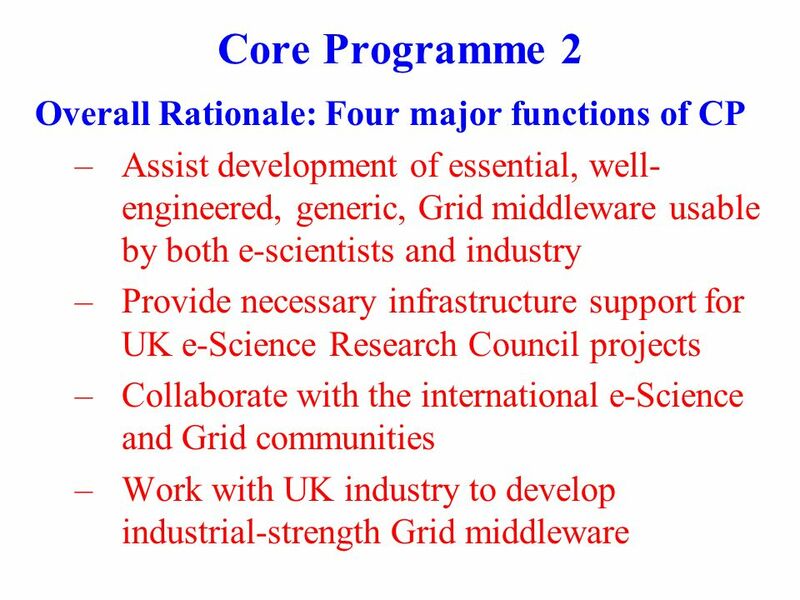 OMII-UK Steven Newhouse, Director. 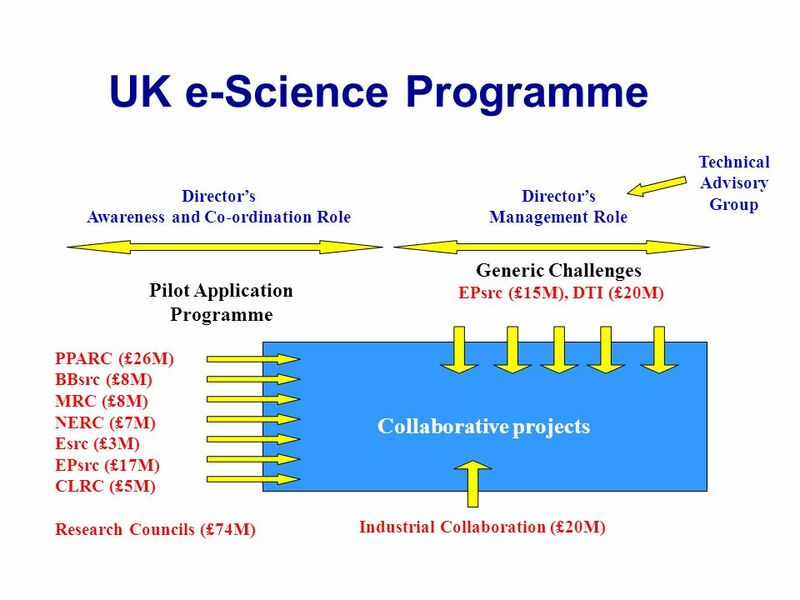 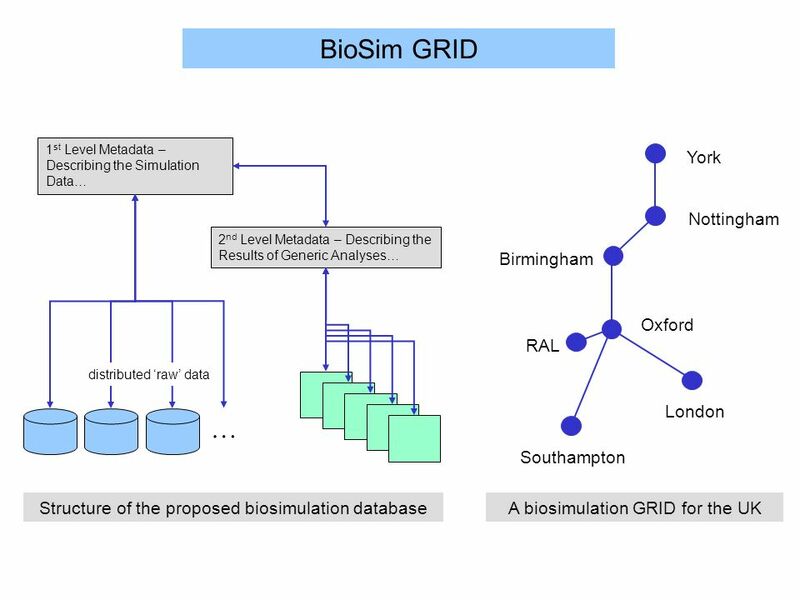 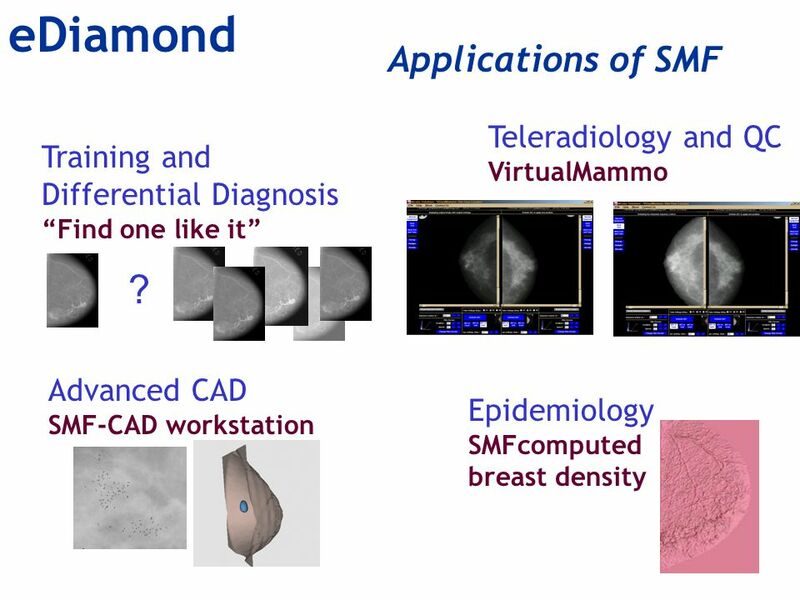 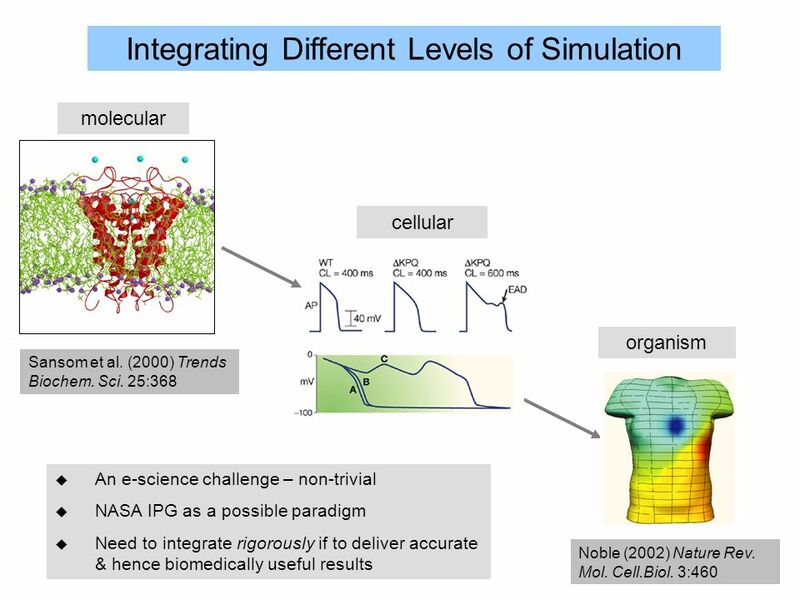 © 2 OMII-UK aims to provide software and support to enable a sustained future for the UK e-Science community and its.